I like to follow what gun guys are selling, and one of my favorites is in Italy, Euroarms Italia. Not that I can afford what they sell and get it shipped over here, but it is nice to see something new come along. 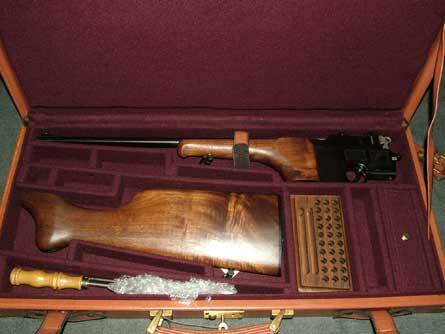 One of their new arrivals is a Mauser Broomhandle Carbine. Mauser did make some of these things, but they are extremely rare and can get into $20k or so. Kaiser Wilhelm used to have one, (You remember him, he caused the Brits lots of grief in WW1). This one, however is made by Federal Ordnance, one of a group of U.S. gun makers/sellers that sprouted up after WW2, when huge amounts of suplus gun parts flooded the market. Based in southern California, they started out selling surplus guns, but when supplies started to dry up, machinists and foundries were employed to build guns from what parts were available, and considering the number of companies involved, the results ran anywhere from pretty good to maybe not so good. They are mostly known for their M1 carbines, but any kind of parts they could buy, and make a buck from, was fair game. One of those guns was the Broomhandle Carbine. Most of the Broomhandle Carbines were made from parts sourced in China, whether built by Mauser or by the Chinese themselves. Federal Ordnance built their own receivers, as most of the parts were from full-auto Schnellfeuer models, and the receivers weren't importable into the U.S. From trolling the forums, they seem to have been built ok, and sometimes if there was a problem shooting them, it usually came down to a worn out spring or some such thing. Even a standard Mauser Broomhandle is a finicky beast, so problems with an aftermarket gun could be considered reasonable. Some guns (not this one) were converted to 9mm and sometimes they have feeding or operating issues. They are interesting guns, nevertheless. Broomhandles are from a time past, but once you have one apart you really are transmitted to an earlier time, when anything was possible with enough machine tools. Federal Ordnance sold these guns in a nice lined case and got about $1500 for them, and their value still holds to this day.